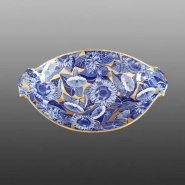 Shown here is an example of the pattern printed in blue on an earthenware dessert dish with gilding added. An earthenware side plate printed in the Sunflower pattern also known as Convolvulus. The pattern dates from 1812 and is an all-over sheet pattern. Both the sunflower and the convolvulus or morning glory are featured in the design, but the original name of the pattern was probably Sunflower.